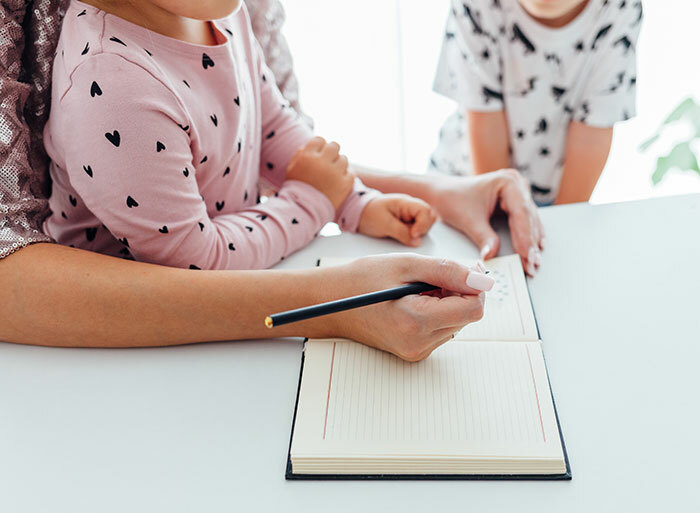 Learn the secret to being a more productive and less busy mom with a step by step guide to decluttering your schedule to make time for what matters most. Do you ever feel like you're busy all day but you're not actually sure what you accomplished? Or you spent the day doing ALL THE THINGS but can't cross one item off your to do list? This is what I hear from moms all the time (and how I have felt myself). Whether you are parenting toddlers or teens, being a mom today means being a busy mom. It means having a never ending to do list and no time to do everything. FIND the time for things I needed to do. TAKE the time for things I wanted to do. 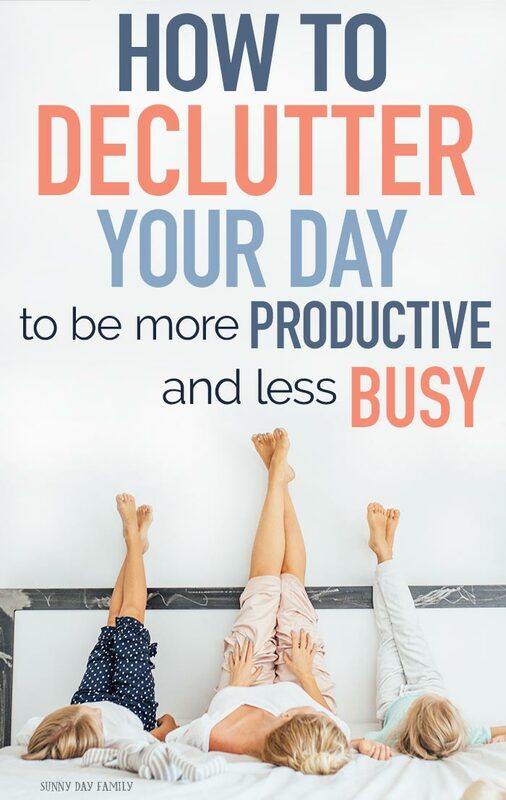 Are you ready to declutter your day and get more time for the things you love? Let me show you how with all the tools you need, including a printable workbook to get you started. When you think about your daily schedule, what comes to mind? 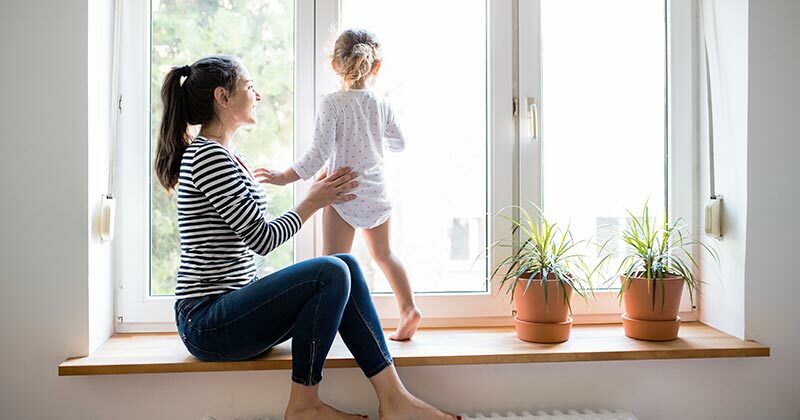 Moms have to juggle a lot of responsibilities every day, from taking care of the kids and the house, working inside or outside the home, and not losing their minds in the process (this is where the "me time" comes in). It can be totally overwhelming. That's why I've developed this process to help moms figure out how to spend their time in ways that are productive and fulfilling, instead of feeling like you're on a giant hamster wheel. There are 3 steps to help you get started being more productive and less busy: figuring out how you spend your time, identifying what kind of tasks you're doing, and making a plan to move forward. As you work through this process, you’ll be able to identify the things that are making you busy and keeping you from being productive. You’ll also discover the difference between the things you HAVE to do and the things you WANT to do. And hopefully you will learn to balance them each day! First, you need to figure out how you are currently spending your time. This seems simple but can be very surprising! Start by keeping a daily time log. Record what you do each day for a minimum of 3 days. You may want to complete this exercise twice: once for school/work days and one for weekends. As you go through your day, notice any “bottlenecks”. These are the times that you are doing something that doesn’t truly fall into your “need to” or “want to” categories. Are you mindlessly scrolling social media? Do you find the morning or bedtime routine is out of control with too many things crammed into a short frame of time? Note these roadblocks as these are things you'll want to avoid. Once your logs are complete, go through them and identify what your regular “need to do” tasks are, what your “want to do” tasks are, and things you can do for “me time”. These can be general categories: for example, you need to get the kids out the door in time for school. You need to go to work. But you don't need to check email first thing in the morning if you find it is creating a bottleneck in your day. You can put this on your list of things to avoid to help your day move more smoothly. Now that you have a handle on the things you need to and want to do, it’s time to make a plan. Identify your Top 3 must do items each day (experts agree that a 3 item list is the way to go), the things that you want to do, the traps you should avoid, and take notes of how each day is going. As you go through your day, focus on getting those Top 3 items done first. Then as you find pockets of time, go to the list of things you want to do, instead of falling into one of the traps (like scrolling through Instagram or turning on the TV). 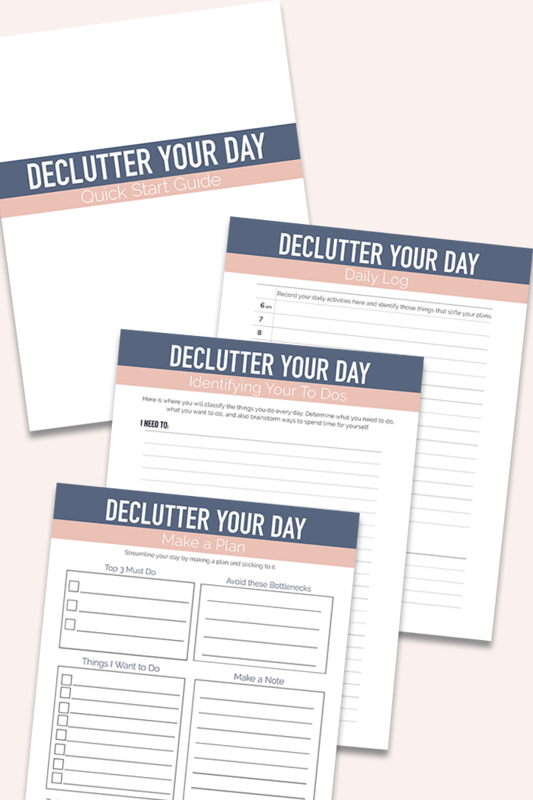 I've created a printable workbook to guide you through the process of decluttering your day. Inside, you'll find the daily time logs, pages to identify yours tasks, and a daily to do list. But the workbook is just the beginning. You can buy it alone here for $4.99, or get it for FREE when you purchase the Ultimate Productivity Bundle. 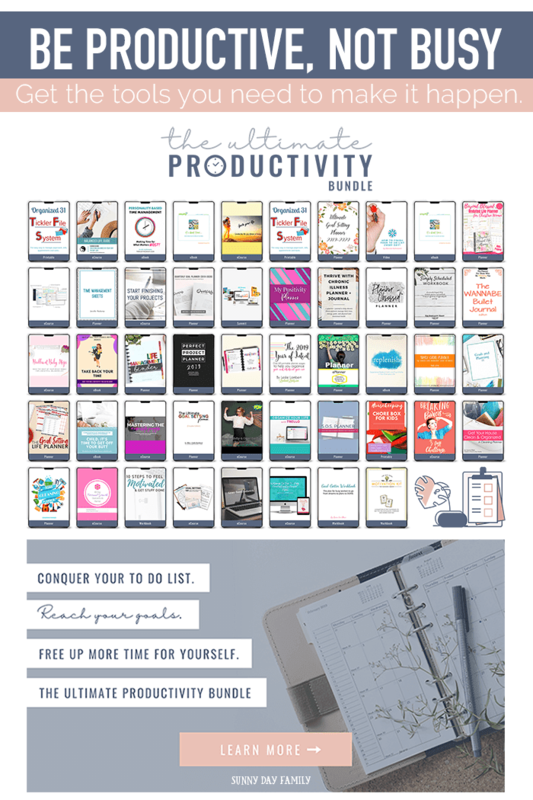 The Ultimate Productivity Bundle is a collection of 46 ebooks, printables, and planners (including my House Cleaning Planner) to help you be more productive and take control of your days. Still have questions? Let me help. A1: This bundle is a collection of 5 eBooks, 14 eCourses & videos, 26 printables & planners, and 1 summit. Inside this bundle, you will find tons of resources to helpset goals, save time, work more efficiently, manage your home,, and so much more. It’s basically one big, productivity pack - all for one low price. A2: There is no way on earth each of these eBooks / eCourses is relevant to where you are right now. Some of them will have a lot of appeal, and some won’t. But in most cases, it only takes 3 or 4 eBooks or eCourses that you’re going to use for you to start saving money. Not to mention, there are 15 resources alone that are worth as much or more than the cost of the bundle itself. So, even though you won’t use every resource in the bundle, it would still be really hard to not save a ton of money anyway. A3: The Ultimate Bundles team spends months reviewing potential contributors, approaches only the best for inclusion, and then only accepts the top products that they think will have the most appeal out of those. Many of these are even full-length eCourses with video tutorials or even access to a private Facebook group! They are highly selective and it shows in the final curated collection. One of the planners in this bundle is mine and I wouldn't be a part of it if I didn't believe in the quality of the other titles. Q4: OK, but what if I buy it and don’t like it? A4: Although Ultimate Bundles has an extremely low return rate at less than 1/4 of the industry standard, there are some people who it doesn’t work for. That’s why they offer a 100% happiness guarantee refund policy for 30 days. If you don’t love it, just email customerservice@ultimatebundles.com to ask for a full refund. But don't just take my word for it. Click the button below to get your bundle, then send me an email at laura@sunnydayfamily.com to claim your FREE bonus workbook! It's that easy. What a great concept to declutter your day - I need to do this periodically. I love your sensible tips and tricks... so effective for busy moms.